Fall exhibition artist Rafael Lozano-Hemmer is internationally recognized for his physically and socially engaged science-and-technology-driven art installations. Art historian Ed Shanken situates these and other artists’ works in his well-known writing on the subject of digital and new media. Join the two in conversation as they consider the convergence of art, science and visualization, with a special emphasis on surveillance, a topic explored by the Gund Gallery earlier in 2016 and continuing in additional exhibitions and programs throughout the fall. 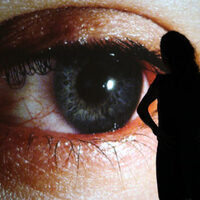 Rafael Lozano-Hemmer is an electronic media artist who utilizes robotics, computerized surveillance and telematics networks to create interactive installations that make use of architectural, performative, and phantasmagoric qualities. Born in Mexico City in 1967, Lozano-Hemmer attended college in Montréal, Canada, earning a B.Sc. in physical chemistry from Concordia University, and today he divides his time between Montréal and Madrid. Lozano-Hemmer has exhibited internationally since the 1990s, most recently in solo exhibitions at the San Francisco Museum of Modern Art, the MUAC Museum in Mexico City and the Museum of Contemporary Art in Sydney. He was the first artist to officially represent Mexico at the Venice Biennale with an exhibition at Palazzo Van Axel in 2007, and has since continued to exhibit in Art Biennials and Triennials around the globe. Among his many awards are two BAFTAs from the British Academy, a Golden Nica at the Prix Ars Electronica in Austria, the Governor General’s Award in Canada, the Trophée des Lumières in France and an International Bauhaus Award in Germany. Lozano-Hemmer is a faculty associate of the Graduate School of Design at Harvard University. Edward A. Shanken writes and teaches about the entwinement of art, science, and technology with a focus on interdisciplinary practices involving new media. He is director of the Digital Arts and New Media (DANM) MFA program at UC Santa Cruz and Associate Professor in the Arts Division. Prior academic posts include the Digital + Media MFA program at Rhode Island School of Design, DXARTS Ph.D. program at University of Washington, New Media International MA at University of Amsterdam. Fellowships include National Endowment for the Arts, American Council of Learned Societies, UCLA, University of Bremen, University of Memphis, and Washington University in St. Louis. Dr. Shanken earned a Ph.D. and M.A. in Art History at Duke University, an M.B.A. at Yale University and a B.A. at Haverford College. Rafael Lozano-Hemmer’s residency has been made possible through a grant from the Andrew W. Mellon Foundation, with matching support from the Gund Gallery Board of Directors.